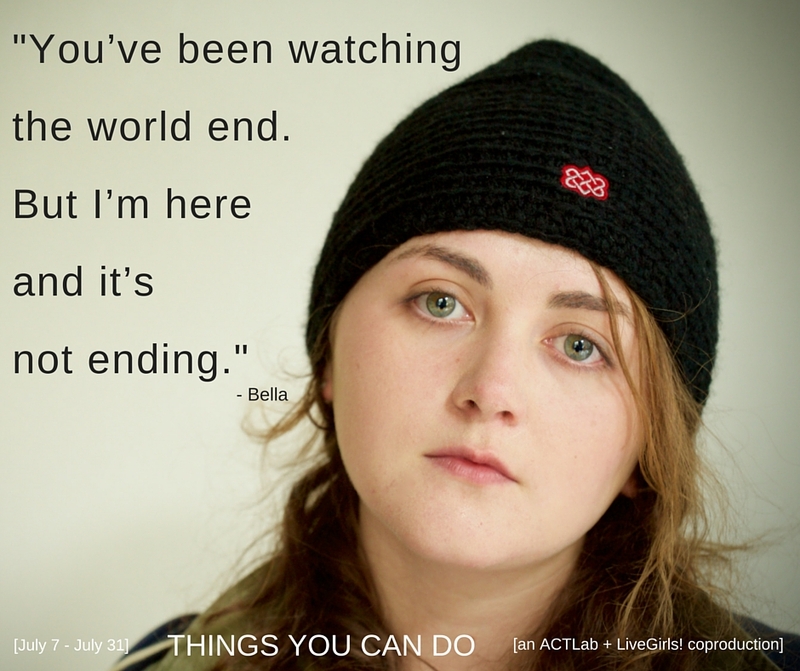 Meet Clara Hayes, currently playing Bella in Things You Can Do July 8-31! Clara Hayes is thrilled to be making her Live Girls! and ACT debut. She is a rising senior at Cornish College of the Arts where she focuses on acting and playwriting. She wants to thank her mama who bought tickets to this show the day they went on sale. What was your favorite moment so far working on this piece? My favorite moment was getting the note last week that we could start to do less up there and just live in the story. That’s always a nice place to be, and a relief to arrive there two weeks before we actually open. What images or songs helped inspire your character work for this play? Oooh music is key! 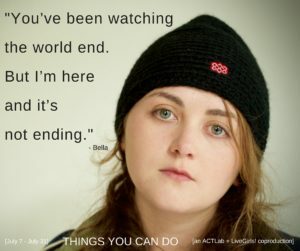 The music of Courtney Barnett, Hop Along and Andrew Jackson Jihad definitely helped me tap into Bella’s angst. As far as images go, I’m not gonna lie. The faces of my middle school arch enemies definitely pop into my head when Bella experiences the wrath of the school bully Kia. What future projects are you excited about working on? Finishing school! Ha, I am excited for that but really, I am a part of a theatrical duo called “The Wise Children” and I am so excited as we are getting our show ready to go on tour! Currently that means lots of re-writes, staged readings and a show at The Pocket in December. But I’m really excited for the touring/adventurous part. I would want a superpower called “The Bigot Detector” where I could spot sexist people and shoot them with a ray gun of feminism power. Teachers always tell me to trust myself. And when I do, things seem to work out better. I love theater that is poetic. Arrange those words in a way that’ll pull at my heart strings in that sweet, melancholy way, dude. I’m about to turn 21, so I’m secretly (until now) spending my spare time practicing dance moves in my room so I can hit the clubs and just try and keep up…ha…but I’ll probably still look dorky.